Oops I did it again! I decided to go and browse around the MAC counter, that was a very bad and harmful decision for my debit card. For the past few days I got myself into using darker eyeshadow, I feel like they bring out the blue tone in my eyes. I normally stick to my brown shades, but this time I wanted something different. I recently done a post on my MAC quad palette, you can read more about it here. Finally got my hands on the MAC large palette, can't wait to build it up with beautiful colours. Beauty Marked eyeshadow looks so beautiful, I have fallen in love with the glitter. It's very dark, would be amazing for smokey eye, I finally need to learn how to do it. Star Violet is a pinky-brown plum, looks beautiful all over the lid, with a darker shade in the crease. Cranberry is a very popular shade, it's a reddish plum with pink shimmer, such a beautiful unique colour! If you have any colour recommendation, please feel free to let me know. I just can't wait to experiment with it. I have very mix opinion on the MAC foundations, but as I am a foundationholic, I wanted to try out the MAC Studio Fix Foundation, I don't have any opinion on it yet. Have any of you had a chance to try it out? What do you think about it? I must say that MAC has a pretty alright prices for foundation, as for a high end brand, and the colour range is amazing. Star Violet looks gorgeous, its going on my list! 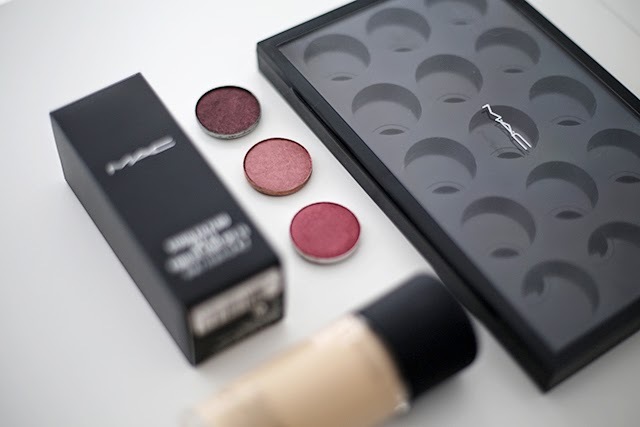 You got some great things :) I love building up MAC palettes, I'm currently on my second one! Gorgeous choices, beauty marked looks stunning! I love the look of the redesigned mac palettes, so sleek and much more practical then the previous ones. I look forward to a full post once yours is full. I'm so tempted by getting a 15 pan palette, could you possibly do a look with Cranberry I never know how to wear it. I really want to start my own palette but I'm just concerned about how much I'll end up spending on it. Is it possible you can update us as your palette fills up? Beauty Marked is a gorgeous shade and definitely one I have had my eyes on. It reminds me of the last shade on the left of the Naked 3 palette! I love what you picked up, those three eyeshadows are gorgeous!